Only 153 of these were made in '62 (a great early year!) Fine surface checking on spruce top only; rare SOLID WOOD top, not laminated (can see lines from underneath w/ mirror); flamey maple back/sides are beautiful and have great color; no bad dings or cracks; years ago, fretboard cracked and was replaced w/ an ebony dot-neck (no neck reset) Overall VG+ condition with some crazing; The parts on this guitar are worth quite a bit more than the guitar, but I refuse to part something like this out. 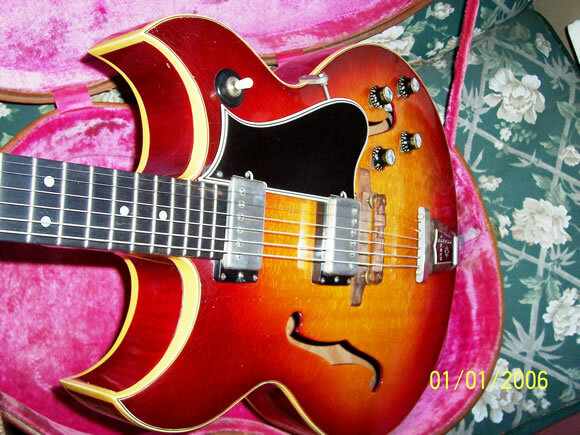 All original parts: black bonnet knobs, single-line, single-ring Klusons (these are worth $900, given what they go on), early Patent Number pu’s (pre T-tops, worth $2000 alone and very close to the PAF's really); orange tag intact inside; Truss Rod cover says ’custom’ (original, these sell for $200); Note: guitar is pictured with a Brown/Pink Lifton case, but I have the HTF original black Gibson case with orange interior that is in EX+ condition (worth $400). I HAVE SEEN THIS SAME GUITAR SELL FOR $7k-$8k WHEN IT HAS PAF STICKERS ON THE PICKUPS! !